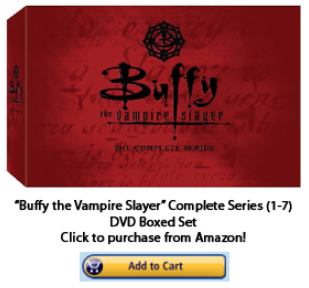 The “Buffy” Complete Collection box set is a must-have for any fan of the esteemed and historic television series. From the heartwarming, cliched first season to the two following ones that bring back memories of high school — yes, both good and bad — to the later ones that reflect on life in college, at work, and in the real world while becoming steadily darker, the show has captivated both original fans and new ones alike. Those who are not familiar with the program, of course, need to remember one thing: “Buffy the Vampire Slayer” is not really about a superhero fighting vampires and demons each episode — the supernatural elements are merely metaphors for the true themes of the show: the trials and tribulations of growing up (or, as someone once put it in reference to the first three seasons, “high school is hell“). In Sunnydale (the fictional town that serves as the setting), it’s just literally true as well. The first season of the “Buffy” Complete Collection box set introduces Buffy Summers, a sixteen-year-old girl who is the latest is a thousands-of-years-old line of (always female) slayers, who is the “chosen one” of her generation to fight the forces of evil. Buffy has moved to Sunnydale, California, from Los Angeles to start her sophomore year of high school after getting kicked out of her old school for burning down the gymnasium (which had happened up be full of vampires — see the “Buffy” 1992 movie that served as the prologue to the television series). Buffy meets her watcher, a teacher/mentor/guide who will end up serving as a father figure as well, along with a cadre of friends who, once they learn Buffy’s identity, join her in the struggle to save the world. From the first three seasons in high school to the last four that focus more on college, the work world, and adult life in general, the characters in “Buffy” change and (usually) grow as people, and the character development has been one of the reasons for the show’s cult following. The people are three-dimensional and believable — enough so that after some of them die in battle (or in other situations), viewers weeped for hours afterwards. One main character, as you see in the first seasons in the “Buffy” Complete-Collection box set, is a “dork” in high school who is not that gifted academically, bullied by classmates, and ignored by women. After graduation, he does not go to college and instead moves into his parents’ basement while working dead-end, part-time jobs like pizza delivery. Eventually, he finds a stable, loving relationship, starts a career in a trade, and eventually becomes a confident, successful businessman. Another character is a computer-geek wallflower who does not fully “blossom” until her senior year of high school and first year of college — she finds confidence and her true calling in a new religion while discovering something personal about herself that would change anyone’s life dramatically. In the end, Buffy considers her the most powerful “Scooby” of all. And these are just two characters out of a main and supporting cast of many people. All of the characters in “Buffy” are, in various ways, outcasts from general society. (Being a so-called “dork” in high school is just one, more-literal example.) And this is likely way so many people — then and now — love the program. Numerically speaking, there are always more less-popular people than popular ones — and “Buffy” is one of the few shows to highlight their lives in a complex, three-dimensional way. The fact that the “Scoobies” just also happen to save the world time and time again — almost always unbeknownst to their classmates and society in general — is just a bonus.